General Electric markets a line of Profile refrigerators for residential use. 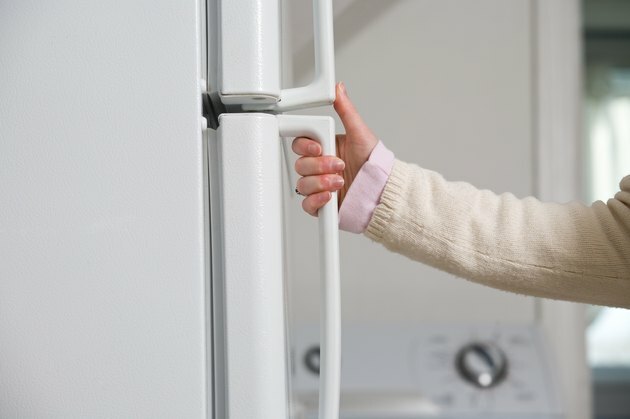 These refrigerators perform as expected with routine maintenance and care. The interior courtesy light, like any light bulb in the home, can burn out and require replacement. If your Profile refrigerator has LED compartment lights, a service technician must be called to repair the lights. If your Profile refrigerator has incandescent compartment lights, though, you can replace the bulbs yourself. Open the refrigerator door, then locate the light shield covering the light bulb on the ceiling of the refrigerated compartment. Grasp the light shield at the rear, then gently pull to release the tabs that hold the back of the shield in place. Tilt the shield down, then pull it forward to release the tabs holding the front of the shield in place. Grasp the bulb gently, then rotate it counterclockwise to unscrew it from its socket. Insert the new light bulb into the socket, then turn it clockwise to screw it in until it is seated. Reverse the disassembly procedure to reinstall the light shield, then plug the refrigerator back in. Disconnect power from the refrigerator. Open the freezer door, then remove the freezer basket. Locate the light shield covering the light bulb on the rear wall of the freezer compartment. Grasp the light shield at the top, then gently pull to release the tabs holding the shield in place. Reverse the disassembly procedure to reinstall the light shield, reinstall the basket, then plug the refrigerator back in.